FOScreations is specialising in bespoke painting for any interior whether this is at home or your business. The artist and founder of the company Maria Papadatou, has a wealth of experience in painting and translating people s ideas on canvas. 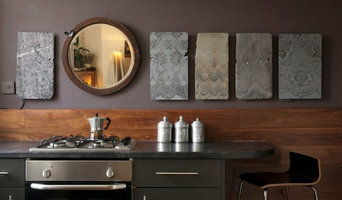 FOScreations is also collaborating with interior designers and architectural offices. 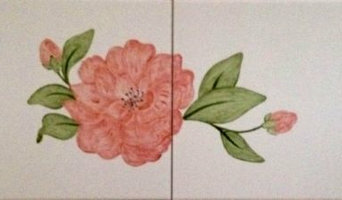 Specialist in hand painted, kiln fired tile panels for kitchens, bathrooms etc. A wide range of original designs available but bespoke commissions, large or small, are welcomed. Stock designs can be adapted to suit or customers' own ideas can be used as a basis for the design. 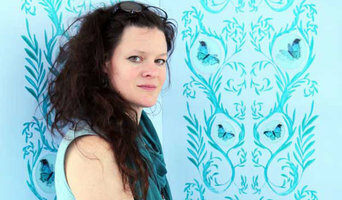 Muriel is luxurious, handprinted wallpaper, designed and made with craft by British artist Sarah Jane Palmer, an artist and designer with a passion for pattern, animation and visual trickery. In 2015 she created new design brand Muriel. 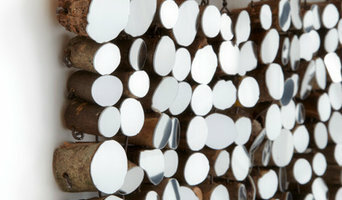 Twinning contemporary art practice with design for the luxury interiors market, her work is attracting a growing international audience. "What I love is that I can create subtle movement that a glance could miss, but that a second take might reveal. It makes a space a more interesting place to be, when it keeps showing you something new.” She is passionate about the importance of developing precision skills by hand, and is a voracious student, constantly adding to a bank of finessed techniques, such as hand-flocking, gold leaf, embossing and building her own wallpaper screen printing press at her studio in Sheffield, England. Handmaking is such an important element of her design – it adds a second layer to that story, creates elements of human touch that give people more to look at, discover, wonder about… Sarah Jane Palmer is the first person to bring to the world of wallpapers Murielmotion - Interactive, animated wallpapers using traditional printing techniques with Lenticular technology following a very successful crowdfund campaign. Muriel Design makes bespoke feature walls and interactive animated wallpapers combining a variety of traditional wallpaper making processes combining hand made and digital reproduction depending on the clients requirements. I provide a palette of possibilities including gold leaf, flock, metallics and animation. We are a family run business of two generations. In a world where true Artisans are diminishing, we are extremely proud to keep traditional hand woodcarving alive. "TRULY BESPOKE". From concept to creation, the only limits are your imagination. We provide the complete bespoke package to your own designs, dimensions and details. Clement Interiors - specialist painting and decorative artist including paint effects, gilding, mural artist, etching & painting commissions. Established by decorative artist Pierre Clement, who has over 25 years experience of working on a range of projects including restaurants, member's clubs, boutiques and private houses. He provides a professional service for discerning clients with great attention to detail and creative flair. He also has a reliable team to call on for larger schemes or where tight deadlines are important. asart is the home of contemporary paintings and sculpture from China and South East Asia and artwork by indigenous Australian artists as well as select works from contemporary artists of note throughout the world. Every year asart introduces new work from Asia/Pacific to international buyers and collectors via major art fairs and exhibitions and sites such as Houzz. In 2011, at the Beijing International Art Exposition, asart received the "Most Influential Gallery" award from the Ministry of Culture, People's Republic of China, in recognition of the quality and originality of the artists we exhibited. The quality and originality of artworks from Asia assure that art from this region is the new frontier of artistic discovery. 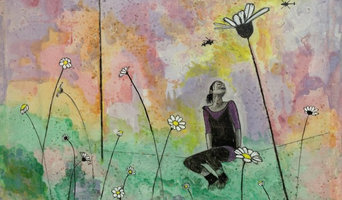 asart also handles artwork by elder Indigenous (Aboriginal) artists from Australia. Aboriginal art, some call it "dot paintings", is one of the great movements of our contemporary art world, yet it is based on traditions that go back over 40,000 years.